A high rate of disability was reported by the local administrative authorities of two remote villages (Adagalu and Muttalageri) in North Karnataka (India). Valmiki, Kuruba and Madiga communities are the predominant residents of these two villages. Based on the request of the local administrative authorities, a community-based survey was conducted to ascertain why in select communities in these two villages has had high incidence of disabilities. The objectives of the study were to identify the risk factors associated with motor disabilities among people affected in these two villages, and to recommend an educational intervention program for the village health care workers and community members to prevent the re-occurrence of such disabilities among the newborn children. This was a cross-sectional community-based survey. Adagalu and Muttalageri villages in North Karnataka were the areas studied. The study duration was from 2006 to 2008. A team of professionals visited the two villages to screen the population affected with disabilities. The local administrative authorities intimated the residents of these two villages regarding the purpose of the team's visit and the need for screening of the disabled individuals. The screening of people with disability was done in one of the government schools with the help of Aanganwadi teachers. There were equal representations from each community. The data were analyzed using descriptive statistics by estimation of percentages. The population of Adagalu village was 3600 and that of Muttalageri village was 4501. The total number of disabled subjects in these two villages was 115, of whom 68.70% (n = 79) had physical disability. 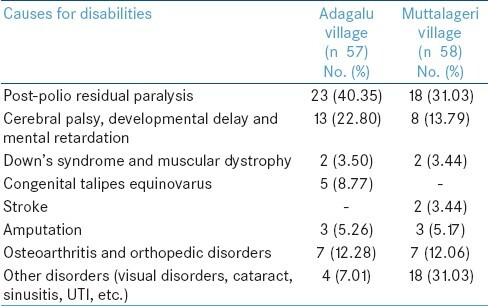 The type of disability in the two villages is shown in [Table 1]. In Adagalu village, 40.35% (n = 23) had PPRP, while the same was 31.03% (n = 18) in Muttalageri village. Of those who developed PPRP, 17% had a history of injection in paralyzed muscle group and 29% had history of injection in non-paralyzed muscles group. It was noted that the paralyzed injected leg muscles were weaker compared to non-injected paralyzed muscles. Only the lower limbs were affected among the polio-affected individuals. Out of 41 individuals affected with PPRP in these two villages, only 21.95% (n = 9) had paralysis of both lower limbs, while the remaining 78.04% (n = 32) had single limb paralysis. PPRP was limited only to Valmiki and Kuruba communities of these villages. In our study, it was observed that nearly 93% of the subjects affected with PPRP were in need of major orthopedic intervention and all of them required orthotic support for their improvement in functional skills. Analysis of cases showed that 51% of them could have been prevented from developing severe contracture if treatment was made available at initial ages. It is important to regularly follow-up the affected population and provide intervention in terms of educational awareness to the health worker/community members/Aanganwadi workers about disability causes and effects, need for hygiene and sanitation, ways of improving literacy rates (especially among women), training in identifying disabilities, and vocational training for the disabled, which will be of great benefit to the affected society in minimizing the impact of disability among its members. The limitations of the study were as follows: It may not be possible to distinguish between provocative poliomyelitis (caused by incubating polio virus attacking the hyperemic anterior horn cells) and traumatic neuritis (direct mechanical damage to peripheral nerves) without testing for the presence of viruses in stool samples during the acute phase. In addition, prevalence of residual paralysis underestimates polio incidence because polio cases which die in the acute phase or later due to complications of disability are missed from the count. Based on this community survey, it may be concluded that injection must be avoided among children during acute viremia state and use of OPV should be encouraged. We would like to acknowledge the administrative authorities of Badami Taluk, Bagalkot district, India, for their support and the Aanganwadi workers of the two villages for their assistance. 1. Trojan DA, Cashman NR. Current Trends in Post-Poliomyelitis Syndrome. New York: Milestone Medical Communications; 1996. p. 1-51. 2. Thacker N, Shendurnikar N. Current status of polio eradication and future prospects. Indian J Pediatr 2004;71:241-5. 3. Wyatt HV, Mahadevan S, Srinivasan S. Unnecessary injections and paralytic poliomyelitis in india. Trans R Soc Trop Med Hyg 1992;86:546-9. 4. Deivanayagam N, Nedunchelian K, Shaffi AS, Ashok TP, Mala N, Ratnam SR. Intramuscular injection as a provoking factor for paralysis in acute poliomyelitis: A case control study. Indian Pediatr 1993;30:335-40. 5. Wyatt HV. Provocation of poliomyelitis by multiple injections. Trans R Soc Trop Med Hyg 1985;79:355-8. 6. Wyatt HV. Is poliomyelitis in the tropics provoked by injections? Afr J Med Sci 1980;9:73-80. 7. Guyer B, Bisong AA, Gould J, Brigand M, Aymard M. Injections and paralytic poliomyelitis in tropical Africa. Bull World Health Organ 1980;58:285-91. 8. Wyatt HV. Provocation poliomyelitis: Neglected clinical observations from 1914 to 1950. Bull Hist Med 1981;55:543-57. 9. Wyatt HV. Incubation of Poliomyelitis as calculated from the time of entry in to the Central Nervous System via the Peripheral Nerve Pathways. Rev Infect Dis 1990;12:547-56. 10. Athmanathan S. The eradication of poliomyelitis: Will history repeat itself? Indian J Med Microbiol 2002;20:59-60. 11. Executive Summary: Global Polio Eradication Initiative- Annual Report; 2010. p. 2-6. Available from: http://www.polioeradication.org/content/publications/gpei.strategicplan.2010-2012.eng.may.2010.pdf. [accessed on 2011 Nov 14]. 12. Mathur GP, Gahlaut IV, Mathur S, Upadhyay GC, Gupta VK. Intramuscular injection as a provocative factor in paralytic poliomyelitis. Indian Pediatr 1994;31:529-31. 13. Editorial. Provocation Paralysis. Lancet 1992;340:1005-6.